Pesticides contribute to this reduction of biodiversity in ecosystems. Obviously, environmental risk assessment did not prevent adverse pesticide effects on non-target organisms. This called for an identification of processes that are relevant to extrapolate from simplified investigations to the reality of pesticide effects in the field, one of the prominent research areas at the SETAC GLB since two decades. We identify research areas that are relevant to link toxicant effects from test systems with the ecosystem to increase the realism of pesticide risk assessment. At the turn of the millennium, the question arose if agricultural pesticides affect non-target ecosystems. The majority of researchers and risk assessors did not expect general effects. In experiments, pesticide levels considered to be above concentrations occuring in nature revealed only transient and geographically limited effects. For example, the intentional pulse of high permethrin in a natural stream only caused a 17% reduced abundance of invertebrates at 260 m below the point of injection. Recovery of most invertebrates was complete within 6 weeks of treatment . On the other hand, persistent invertebrate community changes in agricultural streams were observed related to short-term rainfall-induced pesticide input from arable land  and low-exposure effects on affected invertebrates were reproduced in microcosm experiments . Such contradicting observations on pesticide effects—the effect-paradox—sparked a heated discussion also in Germany. Its outcome has fundamental consequences for the risk assessment and application of pesticides as unacceptable effects should be avoided . At this stage, the idea came up to involve SETAC into the discussion process. SETAC’s mission is to support the protection and management of environmental quality and involving stakeholders from all sectors industry, regulation and university. To gauge the interest for a German language branch (GLB), in 1996 the first unofficial SETAC GLB congress was organised in Braunschweig by Matthias Liess, Ralf Schulz and Toni Ratte. 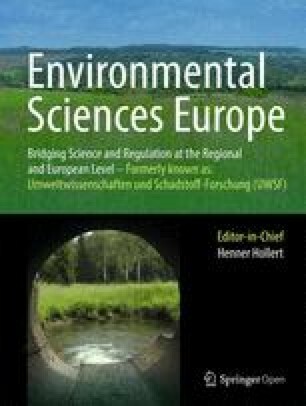 The issue on how to link the results from regulatory tests to the effects observed in the field was the impetus to organise the first SETAC conference on this issue: “Vom Labor ins Freiland—Möglichkeiten und Grenzen der Übertragbarkeit” (From laboratory to field—possibilities and limits of transferability). Due to the great response to the topic, SETAC GLB was officially founded the following year at the conference in Aachen. The contradictory issue of pesticide effects at ecosystem level was also addressed by the EU/SETAC workshop EPiF (Effects of Pesticide in the Field) comprising 75 scientists from Europe and North America, representing government, industry, and academia. After an extensive review and discussion of available studies, it was concluded that “Effects of pesticides were identified in several of the field studies… in streams of intensively cultivated areas” . Since then, an increasing amount of investigations recognised that biodiversity has dramatically declined in agricultural ecosystems during the last decades . Short-term peak concentrations of pesticides in surface water runoff from arable land  were experimentally linked to pesticide runoff with aquatic invertebrate mortality in stream-coupled microcosms . By now, it is generally accepted that also pesticides contribute to this reduction of biodiversity in terrestrial [9, 10] and aquatic [11, 12, 13] ecosystems. Until now, exposure models are not validated with monitoring information. Exposure information need at ecosystem level needs to be used to improve exposure models . Next to contamination of water, sediment toxicity  and remobilisation during flood events need to be quantified . There is need to linking exposure and bioassay response [17, 18, 19]. As multiple toxicants occur in the environment, their combined effects need to be predicted . Impacts of multiple stressors of different types may synergistically exceed the effects of individual stressors. Accordingly, toxicant effects can only be predicted when considering environmental stressors . Monitoring ecological effects  and adaptation to pesticides . Use of pesticide-specific indicator systems to monitor effects  and RAC exceedances . Mathematical models including environmental factors and biotic interactions [25, 26, 27]. Triad and weight of evidence approaches combining multiple lines of evidence . Further development of the risk assessment framework . The listed processes need to be integrated or considered with assessment factors. Due to the high complexity and the variation possibilities of the resulting models, anchoring and validation through monitoring investigations in the field is necessary. Application of governance mechanisms to direct desired developments . ML, TR, PE and HH conceived the topic. ML drafted the manuscript, HH focused the topic in relation to the course of the development of SETAC GLB, TR added information on the development of the prospective risk assessment, PE contributed to the description of current risk assessment. All authors read and approved the final manuscript.